The Golden Rule of “write what you know” is embedded in my DNA. That’s my only explanation for how I came to write “Three Little Bears Visit New York City” before I hit kindergarten. It seemed perfectly reasonable to me; after all, if people go to the woods on vacation, why wouldn’t a bear go to town? And New York City was a place I knew something about. My maternal grandfather had been a photographer in New York, and my father talked about how different “the big city” was from upstate New York where he’d been born. I used to watch my dad doing the New York Times crossword puzzle (in ink!). So the name, the place, was embedded in my consciousness early on. (Does Marja’s name seems familiar? It should! I’ve featured her work here on my site recently. Read the first here and more recently, here.) I hope you’ll stop by http://marjamcgraw.blogspot.com/ and read the rest. I’ll be back here in a few days with a new post. p.s. For the curious: “taleidoscope” is not a typo! Unlike a kaleidoscope (which has brightly colored images), a taleidoscope uses mirrors and a lens to reflect the world around us. 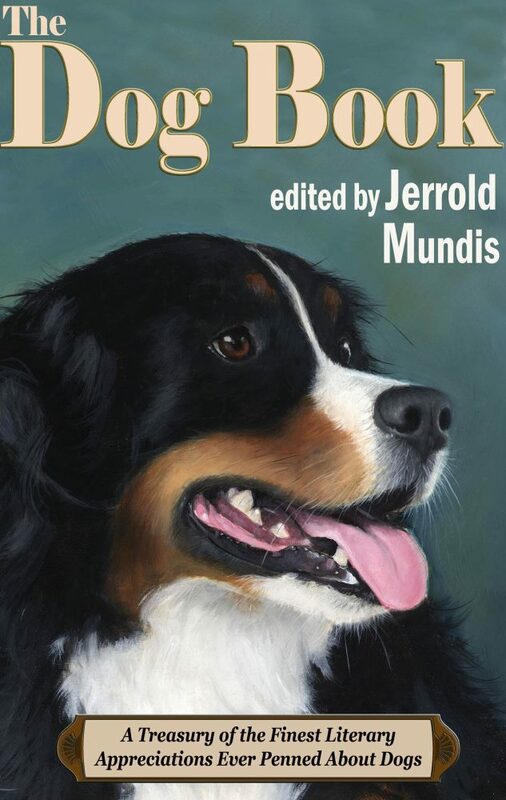 This is the first of a new feature in which writers and fans share stories about their pets. Today’s guest is Barbara Alexander, a retired librarian who now celebrates the written word as a professor, reader, and blogger. When I was 66 years old, I decided it was time to have a pet, a dog, so she could snuggle next to me, I could spend hours petting her, and we could go on walks. 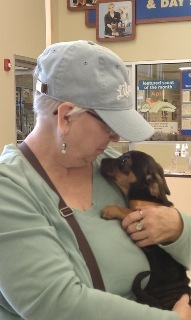 That’s how I came to adopt Snickers Molly Price Tchotchke Houdini Alexander. As part of my bargain with myself to manage taking on a pet, I gave up candy, so I named my puppy Toffee. Apparently no one liked or could remember the name, so we had a family council with suggestions from everyone. 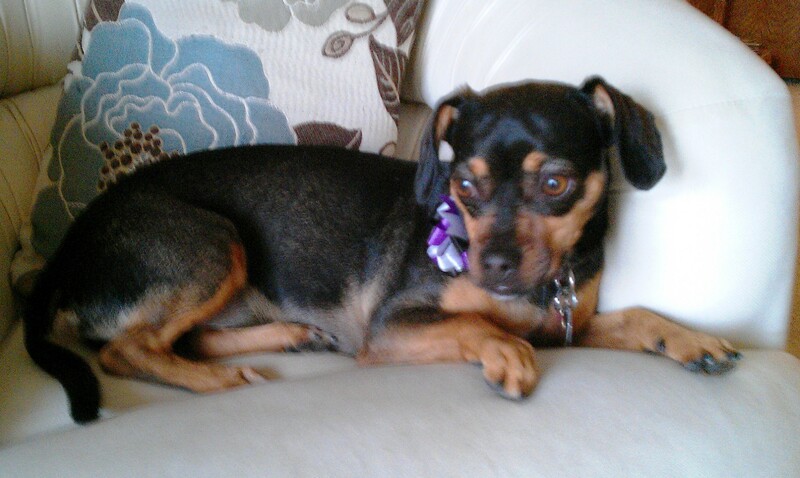 After mulling over it, I decided on my granddaughter’s suggestion, Snickers, for my puppy sports the same coloring. I wouldn’t want to brag about my dog, but Snickers can run faster, drink louder, make more friends, and lick more people than probably just about any other dog in the world. When we’re out for walks, she wants to greet every person and meet just about every dog. She made special friends with the neighbors I never knew, quickly convincing us she preferred people to dogs. This bright, endearing little pup fears dangers in the sky (hot air balloons and cherry pickers) and checks to see if there is a parallel world at the other end of the toilet. Snickers boasts her own dresser drawer of toys because she claimed it by opening the drawer on her own. She hides under my bed when the heat or air conditioning comes on, when she hears loud noises, and especially if she thinks I might be leaving. Happily, Snickers likes to be near me but also gives me personal space. Perhaps best of all, Snickers knows when I don’t feel well, and she licks my sore and achy spots (usually my left toes and ankle (thank you, Snickers!). A reader might wonder about Snickers’ very long name. Price is for my cousins Trudy and Jerry Price, who convinced me I should have a pet after one of my visits with them and their pet-filled household. I added Price to Snickers’ name soon after I adopted her to recognize their role in my adopting Snickers, and soon after both Trudy and Jerry passed, Tchotchke seemed to be a fit. Could there have been a better token of love than my little Snickers? My daughter, her husband, and their daughter gave Snickers the Houdini moniker. They kept her one weekend when I was away, that is, they tried to keep her contained, but she would have none of it. Anne and Tom thought Snickers would stay in the same room in the basement where they had kept their chocolate lab, Ginger. Of course, Snickers wanted to get out and be with the family (she likes people!). While Ginger had stayed behind the French doors, Snickers pushed on them until they opened. Tom built a wall of boxes at the other opening into the pet room; Snickers jumped it, nosed it, and found her way through, surprising all three of the family members at one time or another. In the very same way, jumping, nosing, seeking, Snickers has become my family, so much so that I have caught myself addressing my younger granddaughter as “Snickers.” Fortunately, that young woman understands grandmothers and pets, and remains very understanding. My older granddaughter noted Snickers and I share some of the same characteristics; I knew we were both very determined, both like snacks, both like to solve challenges (someday she will open the patio door! ), and both take naps. We even look alike in one way, as the granddaughter pointed out: Snickers has a crook in her tail that reflects my slightly bent arthritic fingers. My thanks to Barbara for sharing Snickers with us! If you’d like to contribute a story, email me. Meanwhile, be sure to check out Snicker’s latest adventures and other stories at Barbara’s blog, Doors and Windows, at bjatma.wordpress.com. Libraries are one of the most magical places in the world for me, and yesterday I had the pleasure of visiting one of the libraries in the Carroll and Madison Library System. 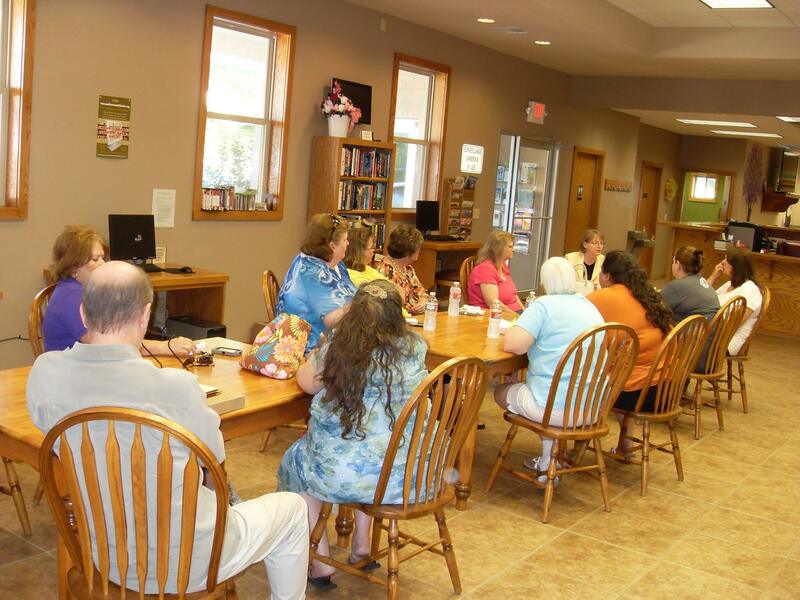 After I was invited to participate in the Books in Bloom Literary Festival, the Madison County (AR) Library’s book club chose my book and invited me to visit. What a fantastic group! Wonderful readers and fans of Deadly Ties! And the ladies of the club? Intelligent, enthusiastic, and passionate about reading–in short, a writer’s dream. They asked wonderful questions, discussed favorite points and plot lines, and clearly connected with my characters in the story. I absolutely loved it when I found out one of the members (known as “the book analyzer” because of her skillful reading) had gone all the way to the Bentonville/Rogers area just to pick up a box of Krispy Kreme doughnuts for us to enjoy during the discussion! (If you’ve read Deadly Ties you’ll know they’re mentioned in the book.) Thanks for the treat, ladies! They were a marvelous audience and I’m already looking forward to my next visit. The Madison County Library is located at 827 N. College Avenue in Huntsville, AR 72740. You can reach them by phone (479-738-2754), email (info@madisoncountylibraries.org), or visit them on Facebook (http://tinyurl.com/nlc5asf). 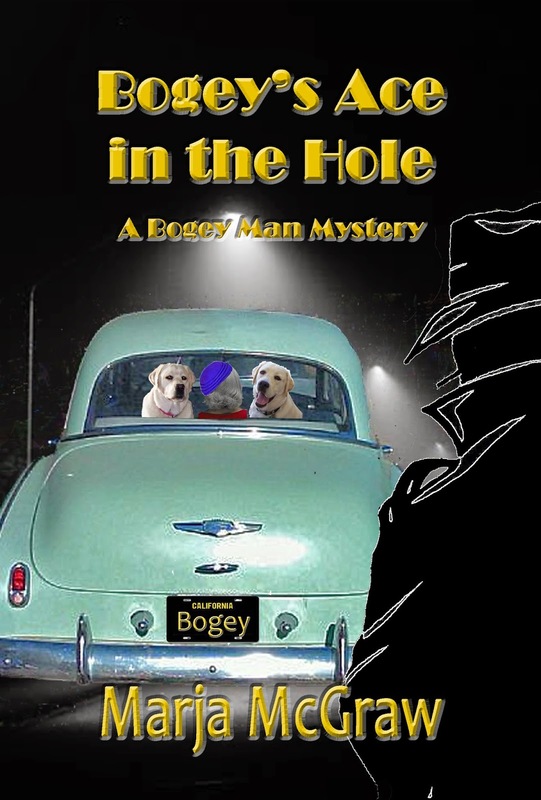 If you enjoy cozy mysteries that are just downright fun to read, you’ll definitely want to check out this re-release of Bogey’s Ace in the Hole, the second book in the Bogey Man Mysteries. (If you missed the first one in the series, check here). Bogey’s Ace is a humorous mystery starring a Humphrey Bogart look-alike with a sleuthing family and their two Labrador Retrievers! In Bogey’s Ace in the Hole, Marja McGraw continues the adventures of reluctant sleuths, Pamela and Chris (the Bogey Man) Cross, but this time she adds a whole new dimension to the meaning of a the phrase, “The family who….”, when their son, Mikey, a seven-year-old going on twenty; and their two yellow Labrador Retrievers, Sherlock and Watson, typical dogs, more interested in eating treats than in behaving themselves, all get involved in helping a group of adorable, but outspoken, Church ladies solve a mystery that will have you laughing at their antics one minute and gasping in surprise the next. If you love a good cozy, this is one of the best. Marja can be found at http://www.marjamcgraw.com/ and her mystery blog is now at http://www.marjamcgraw.blogspot.com/. Note: if you’ve bookmarked Marja’s sites before, you’ll want to update your links, as these are new! I rarely reblog a post. Read on, and I think you’ll appreciate why I chose to reblog this one. My thanks to JW Manus for sharing this story. Today the subject isn’t ebooks. It’s not one of my rants about the publishing industry either. So if you came for one of those, you might be disappointed. It’s not even a boast post. This is about dogs. It’s different, too, since I’m touting a specific book. I don’t normally do that here. My readers are looking for ways to produce better ebooks or to solve problems about ebooks or to find some tips about self-publishing. So if I shout, “Buy this book!” it’s usually for a book that will help self-publishers. Not this time. 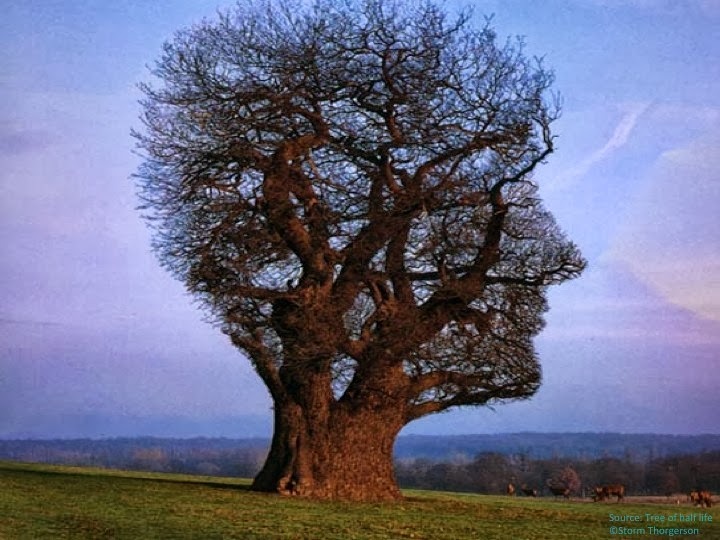 To know why I’m making such a big shift from my regular posts, you need a little background.